Onkyo X9 review | What Hi-Fi? As anyone who’s studied the laws of the school playground will know, being first isn’t always best. That hasn’t deterred Onkyo, however, which has billed the X9 wireless speaker as the first high-resolution audio portable speaker. It’s quite a USP: this HRA-accredited speaker can connect to your PC or laptop via USB to play PCM formats up to 24-bit/96kHz and play (but downsample) 24-bit/192kHz files. There’s still the opportunity to stream via Bluetooth or plug a source into a 3.5mm jack – it’s just that there’s now the scope to go one better. The Onkyo X9 has scale and weight, almost one-and-a-half kilograms, which means it isn’t the easiest to carry around, but it feels satisfyingly robust. Underneath its slim, curved shell is a driver set-up that appears to confirm that notion. You’re looking at a pair of 5cm mid/bass drivers, two 19mm tweeters and two passive radiators, one of which is visible from the rear. The X9 certainly isn’t devoid of armoury. We begin connecting via Bluetooth and stream 65daysofstatic’s No Man’s Sky soundtrack, Music For An Infinite Universe. The first thing we notice is the power, the scale of the sound, which is impressive, not only in absolute terms but in that, for this price, the X9 can combine that soundstage with such musical sensibility. The detail isn’t phenomenal, but there’s more insight than from many competitors. What’s best about the sound, though, is what it does with that insight. The dynamics are as delicate as they are entertaining, the timing is pleasing and there are no hard edges or wobbly low end. Essentially, though not the most analytical of portable wireless speakers we’ve heard at this price over Bluetooth, it is certainly up there with some of the most descriptive; the dystopian drama of 65’s soundscapes is captured immersively. We aren’t going to pass up the opportunity to play some high-resolution files either. Plugging into a Mac, we play FLAC files of Ólafur Arnalds and Nils Frahm’s Loon, downloaded from Onkyo’s own Onkyo Music hi-res service. Compared with the same track played through Tidal, and therefore at CD-quality, there is a step up in terms of detail, but the Onkyo X9 is still restricted within the confines of its own ability. Being tethered to a laptop, it raises a question about the speaker’s purpose – are we striving for the best possible sound, even at the expense of portability? If played in the house we’d probably go for the least-mobile option, but there isn’t a step up enough for us to be overly precious when we don’t want to keep getting up to change records. Sitting the Onkyo next to the KEF Muo and Dali Katch, admittedly each costing more and more again respectively, reveals improvements. Those busy recordings are better organised by the Muo, though without the scale or dynamic range of the X9, whereas the Katch is a step up in each respect (though it doesn’t offer hi-res compatibility). 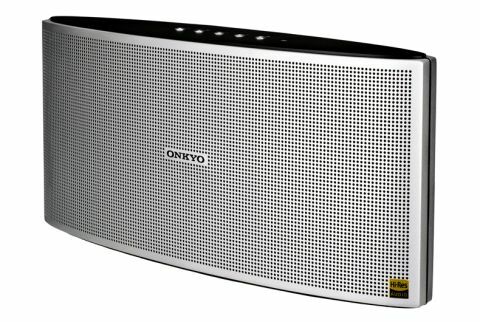 There’s a definite place for the Onkyo X9 within the portable wireless speaker market. If you want to pay more, there are options to deliver better sound, but Onkyo has delivered a product with scale and musicality that is worthy of investigation.